Winter road conditions present safety challenges that fleet managers can address through planning, tracking and driver training. According to the Federal Highway Administration (FHA), “24 percent of weather-related vehicle crashes occur on snowy, slushy or icy pavement and 15 percent happen during snowfall or sleet.” Your fleet operations depend on consistent performance from both your operators and vehicles. Wintry road conditions require additional vehicle preparations and potentially driver training, these steps protect both your employees and your equipment investment. You’ll also want to prepare your equipment for the off conditions and consider ways to minimize operating expenses during winter. For example, make sure that vehicles are up-to-date on maintenance and tires remain fully inflated. Remind drivers to minimize unnecessary engine idling time. Train your operators to follow safe driving guidelines. Another tool available to fleet managers is the information from a telematics solution. The data in real-time or historical can help you stay on top of priorities. We know that winter road conditions present unique conditions. Here are some tips to share with your drivers to prepare for driving on slick pavement. Clear your vehicle of all ice and snow to improve visibility. Wipe off your headlights and taillights at regular intervals to keep them clean. Remove snow from the top of your vehicle so it does not fall and obscure the vehicles around you – some jurisdictions fine you if this isn’t done (e.g. New Jersey and Virginia). Drive at lower speeds. Speed limits are set with optimal conditions in mind. Drivers should slow down on snow or ice. Avoid fast and sharp turns, which could lead to skidding or even the vehicle flipping over. Brake and accelerate gradually. Avoid sudden and quick changes that could result in vehicle instability. Increase the following distance. It is important for two reasons: It allows more time to stop a vehicle in slippery conditions and for a longer reaction time when visibility may be limited by fog or falling snow. Be extra cautious of the changing conditions. Bridges typically form ice before the rest of the road. Be careful navigating around private vehicles, whose drivers may not have experience driving in challenging conditions. 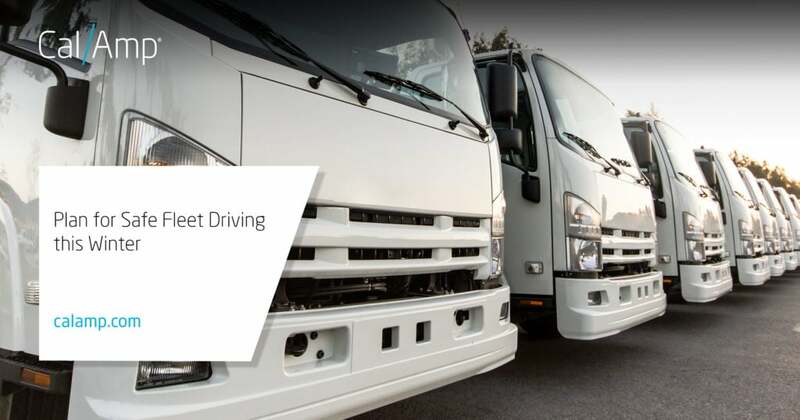 Your fleet telematics solution can tell you a lot about how to plan your driver training. Fleet managers are alerted to driver behavior like speed violations, rapid acceleration or hard braking. Using data from CalAmp’s commercial fleet solutions in a regularly scheduled report provides insight into problematic driving habits, which can be exacerbated when the weather is severe. With the information, create a driver scorecard to help drivers understand where improvements should be made. Service industry calls are often seasonal in nature. For example, during colder months, pipes break, trees fall and furnaces waver so emergency calls increase. Fleet telematics helps you respond faster. Its data gives you instant insight into which vehicles are near a customer location and can respond immediately to a request. Customers appreciate having updated information on when the technician will arrive. A positive response creates goodwill, which helps nurture the satisfaction and loyalty needed for repeat business. Winter conditions don’t need to slow down your fleet. It just requires some proper planning and management. Safe driving during inclement weather serves both the needs of your business and your customers. To learn more about how CalAmp’s commercial fleet solutions can help with your fleet management, click here.